Is Stranger Things Inspired By This Real Lab? Is Stranger Things Inspired By This Mysterious, Real-Life Government Lab? Pictured: Chief Jim Hopper (David Harbour) in the Hawkins Laboratory. It's safe to say that the Department of Energy's Hawkins National Laboratory is pretty much the last place anyone would want to be near in any decade, not just the 1980s. And that's fine, because the Stranger Things location is purely fictional. The inspiration behind it, however, could be more real than you think. Conspiracy theorists have drawn links between Hawkins Laboratory — the sinister science center from which Eleven (Millie Bobby Brown) escapes in season 1, and the workplace of both Drs. Brenner (Matthew Modine) and Owen (season 2 newcomer Paul Reiser) — and Camp Hero, a decommissioned military base on Long Island's Montauk Point that's been shrouded in mystery and rumors about sinister experiments and tunnels. 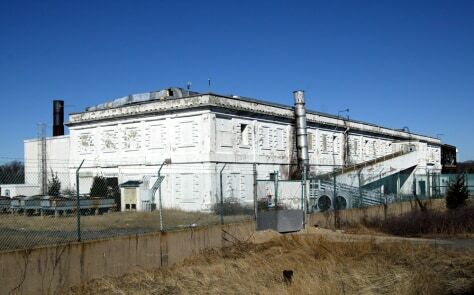 But if the common connection is a sketchy past and intense government secrecy, one can't rule out Plum Island Animal Disease Center's Building 257, located about one and a half miles off Long Island, as a model for Hawkins Lab. Prior to its closing in 1995, Building 257 was used for research on animal viruses — viruses that may remind Stranger Things 2 viewers of the Mind Flayer and its effect on human host Will Byers (Noah Schnapp). But there's more to the story. In 2008 it emerged that a series of "in-laboratory incidents" caused contamination and a potential outbreak of foot-and-mouth disease. Those accidents, coupled with secrecy about bio-weapons research at the lab and throughout Plum Island's facilities, have spurred countless conspiracy theories, controversies, and potential cover-ups.